365 day challenges can be a lot of fun. Just ask reader Mandy Duff who I featured before (Learning to Bead in 365 Days). The year long journey can be uplifting and perhaps wearing at times. However, the experience does heighten one's daily awareness of possible inspirations and requires plumbing the depths of one's creative well! One such large scale event was last year's Ring a Day challenge organized by Lark Crafts, where jewelry makers were asked to "make a ring a day no matter where you are, what materials are at your disposal or how much time you have available." Pretty broad parameters, indeed. Participants then took photographs and uploaded them to Flickr. 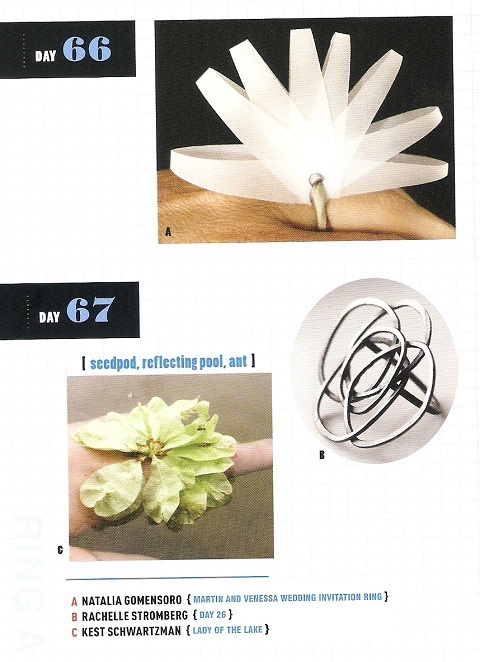 More than 16,000 photos later, 700 were chosen for this book which I received for review, Ring a Day: 700 Photos from a 365 Day Jewelry Challenge . It is an amazing book to look at. 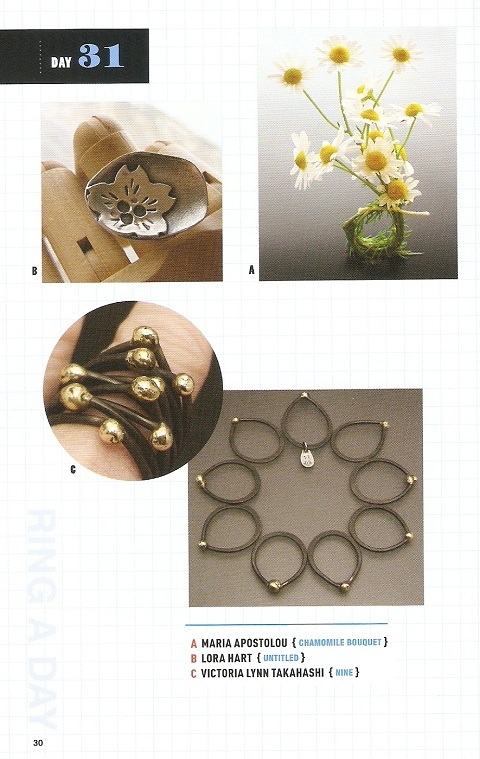 The diversity of the rings as well as the materials used were staggering.The inspirations behind each design were also telling and sometimes downright delightful. Evelyn Markasky, one of the participants said, " I've always known that if you keep doing something, at least everyday, that you will become better at it." 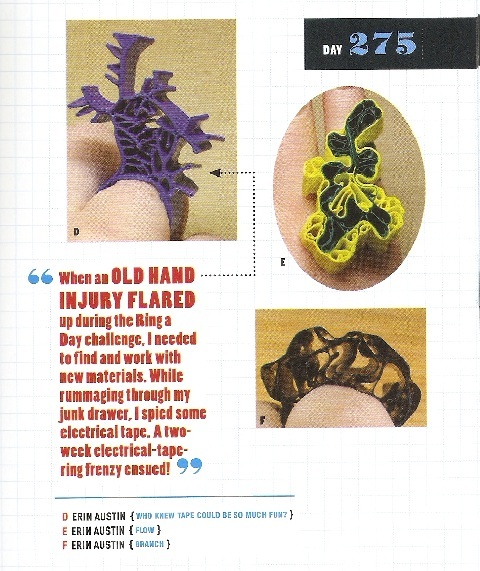 Another, Laura Flavin added " Creating a ring has made me hyper aware of my surroundings, interests, inspirations and memories." The benefits of the exercise were succinctly put by Mary Lu Wasson who said, " I know rings much better now. 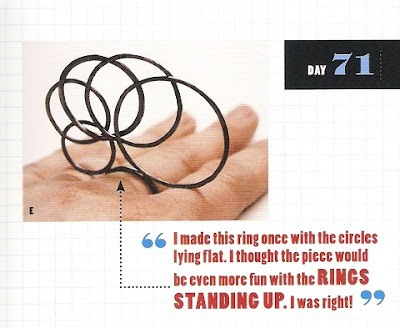 I've thought about rings from every angle. I've seen rings in nature and in found objects. I've created rings from every material that has crossed my path. Every time I practiced a technique, I found a way to do it in a ring." What did they do with all the rings they made? 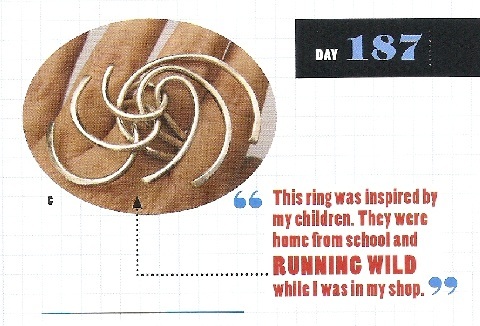 Carrie Nunes raised money for the Craft Emergency Relief Fund by selling her Ring a Day rings. Many of the rings Megan Auth made were not wearable or durable so she got her woodworker husband to make a special display cabinet for them all. A wonderful conversation piece indeed. For each and every participant, the year was definitely a highlight of their creative lives. This book really celebrates one heck of a creative experience.